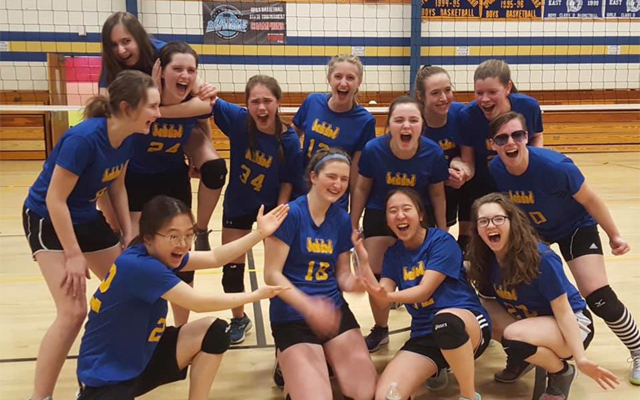 The MSSM (Maine School of Science and Mathematics) girls volleyball team won the Division 2 Aroostook County Championships Friday, 15, at Washburn High School. WASHBURN, Maine — The MSSM (Maine School of Science and Mathematics) girls volleyball team won the Division 2 Aroostook County Championships Friday, 15, at Washburn High School. The boys event was held Saturday, March 16 at Fort Fairfield Middle High School. Teams from Van Buren, Wisdom High School, Ashland, Central Aroostook High School, Greater Houlton Christian Academy, Fort Fairfield, Easton, Washburn, Katahdin, and Hodgdon also competed in the girls event. The MSSM girls went 13-2 in the tournament and defeated Fort Fairfield in the championship. Team captain Victoria Eichorn was selected as the Aroostook County MVP of the tournament and made All Aroostook along with Hannah Zimmerman. The MSSM boys team missed the final four by one game during the boys competition Saturday, March 16.